LONDON–(BUSINESS WIRE)– The global specialty gases market for healthcare industry is expected to grow at a CAGR of more than 7% during the forecast period, according to Technavio’s latest market research. In this market research report, Technavio covers the market outlook and growth prospects of the global specialty gases market for healthcare industry market for 2017-2021. The market is further categorized into three application segments, comprising of analytical and laboratory application, sterilization and others. 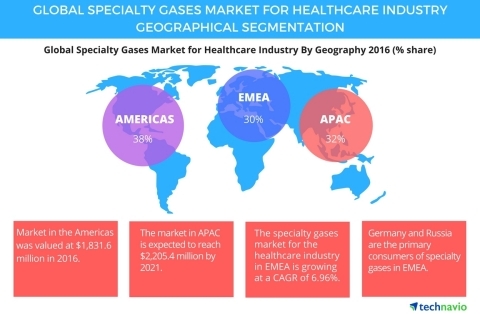 “The global specialty gases market for the healthcare industry is expected to grow rapidly during the forecast period due to an increase in the number of patients and subsequent healthcare expenditure,” says Hitesh Bhatia, a lead industrial gases research expert from Technavio. The specialty gases market for the healthcare industry in the Americas was valued at USD 1,831.6 million in 2016 and the market is expected to grow at a fast pace through 2021. North America accounted for the largest share of the specialty gases market for the healthcare industry in the Americas. The region is also the largest market for specialty gases. Growth in the demand from the healthcare industry is fostering the market growth in the region. In addition, the presence of established market players with production facilities is aiding them to get a foothold on plant expansions. The healthcare requirements and the need for high-purity gases in analytical applications such as gas chromatography and in medical, pharmaceutical, and biotechnological applications are driving the market for specialty gases. APAC has been witnessing an increase in per capita income, which has increased the access to healthcare and acceptance of preventative healthcare measures. In addition, the region has become a preferred destination for medical tourism owing to the low healthcare costs. In addition, the region has a large population of older individuals, which indicates that the need for healthcare facilities will increase. This will increase the demand for diagnostics and effective pharmaceutical products. The increasing dependence of healthcare facilities on specialty gases is expected to drive the market growth in APAC during the forecast period. Germany and Russia are the major consumers of specialty gases in EMEA. The market in the region is also driven by sophisticated laboratories that indispensably require specialty gases for their operations. It is also noted that radon is used for the treatment of arthritis in certain spas in Europe. “Vendors in this region are technologically sophisticated and are the leading market holders in various industrial end-user segments. Cryogenics have immense application potential in this region,” says Hitesh. Become a Technavio Insights member and access all three of these reports for a fraction of their original cost. As a Technavio Insights member, you will have immediate access to new reports as they’re published in addition to all 6,000+ existing reports covering segments like olefins, industrial gases, and metals and minerals. This subscription nets you thousands in savings, while staying connected to Technavio’s constant transforming research library, helping you make informed business decisions more efficiently.